Reading over a house survey is one of the most important steps you will take when you are buying a home, but you may not see it until you are a week away from the Final Settlement. This official drawing is done by a licensed surveyor who will go to the property and create an original map. After finding the corners and taking careful measurements, the surveyor will overlay utility information and draw fences, sheds, pools, patios and the outline of the house. It will also show the setbacks, distances will be in feet, from the front, sides, and rear of the property. In Vienna, Virginia where I work, these surveys are typically emailed to the buyer shortly before Settlement. 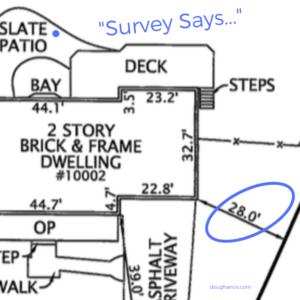 My tip to clients, or any home buyer, is to get a new survey done when you buy the house. Don’t assume one will get done because not all lenders require them anymore. Costs will vary depending on the lot size. To appear more competitive, some national mortgage lenders do not require a new survey because they rely on tax data. In the real world, we know that county tax data isn’t 100% accurate on each property. So, why don’t these lenders require a new survey? Because they are covered. You aren’t, but they are. The loan is covered by lender required Title Insurance which protects their interest in the property. Their investment is covered, but the homeowner is on the hook to fix or remedy fence or existing set back issues. Remember, Virginia is a Caveat Emptor state and it is the buyer’s responsibility to be satisfied with the condition of the property because, after Settlement, it is 100% their house. So, I’ll let you know that you aren’t really saving any money here when you decide to forgo a new survey… You actually decide to add risk. For many tear-down properties in Vienna, the only surveys are the ones at Town Hall that were submitted in 1957. The “tear-down” market is a distinct category of the Vienna real estate market which is extremely competitive. To be blunt, any builder can do a quick n’ easy calculation to determine a building envelope for a specific model in their portfolio. They will then factor in the lot cost, estimate demolition and site work cost, and add the cost of building a new house at a minimum quality. Home buyers bidding on these lots without such a plan have a good chance of overpaying. Sometimes unusual easements get recorded when land is subdivided or sold to new owners. In this example: Fred needed to get to his home and Bob let him use his driveway before it forks off toward his land. The problem is that Fred passed away in 1962, and in 1967 Bob sold his land to Fred’s family who combined these properties down at the Courthouse. Today that property is five minutes from Tysons and Fred’s family wants to cash in since reading on a website that Amazon was coming to town. Spring ahead to today when you are buying part of that property for your new semi-custom home. And then you notice a dotted line and additional Lot number. It’s time to dig deeper. 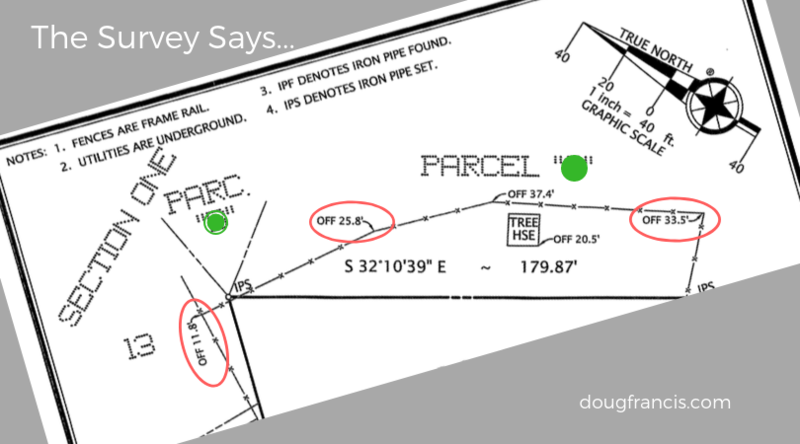 Existing fences are the most commonly looked at notations on a survey. Ideally, I feel you will need an accurate survey if you plan to build or replace a fence in the future. Good fence companies will typically ask you for a survey so they know that they are building a fence on your property. They know that fences build across the line may result in digging up the project and rebuilding the entire a foot away. In much of Southwest Vienna, chain link fences installed in the 50’s and 60’s were built kinda accurately. A survey may show a chain link fence is a few feet over the line, cross the line diagonally, or zig-zag around an old tree stump. Again, a new survey reviewed before Settlement may help establish agreements to resolve fence issues between the neighbors. One new neighbor discovered her neighbor’s fence crossed the corner of her property by one foot. She forced the neighbor to have it moved. In New York City, Rockefeller Center actually owns the sidewalks to the curb. 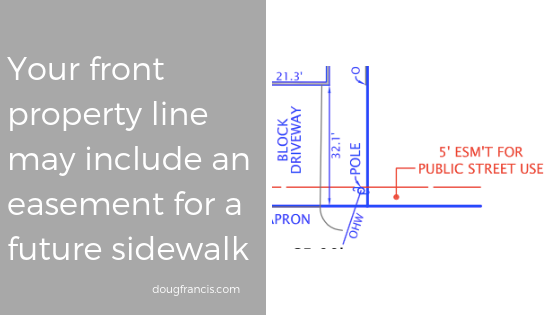 You will find the sidewalks blocked off occasionally to retain the property boundaries. The one-acre property in Vienna looked perfect for a patio and pool. The plan ran into a hitch when the survey showed a 10′ underground sewer easement running under the backyard. My recommendation is to consider options like this one carefully. If a resale home is relatively new, ask your real estate agent to call and ask if the seller has a survey. With all of the infill or tear down homes built in Vienna over the last ten years, many of those owners have recent surveys on hand that they can share. What should you look for? Maybe an addition, covered porch, expanded driveway, or sport-court. Having insights and guidance into potential issues like these are reasons I feel is important to see the survey, and why my clients remain part of the discussion during the home buying process.